The characteristics of bulk solids and powder flowability vary immensely from one product to another. Even products of the same name can have significantly different handling characteristics - whether it is products from the same supplier or different supplier. For silo, hopper, feeder, conveyor and equipment design purposes, it is not possible to obtain flow of solids or powder characteristics from a design codes (such as AS 3774-1996 Loads on bulk solids containers) or industry/suppliers catalogues. 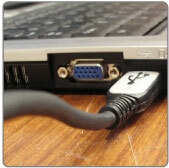 The generic type information is simply not specific enough, nor is it complete to carry out efficient design. FEA programs or structural design verifications of silos and hoppers for example, does not assure that product flow characteristics are evaluated, nor proper interfacing of equipment. The above measurements are obtained for instantaneous consolidation (No storage time), and also for time consolidation (Storage time). 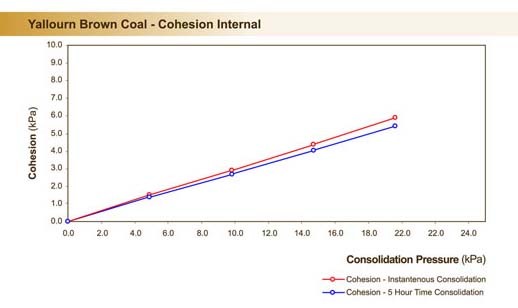 The above graph shows a measurement of internal cohesion. These results, amongst others, are important for the design of silos, feeders and equipment, simply are not available generic type data. A minimum of four tests is usually carried out to develop a family of yield loci. Once these values are obtained, we can then predict how the product will behave at the various consolidation pressures. Calculate the requirements for the design of silos and hoppers for flow regime. Work out the maximum consolidated bin opening pressures for static and dynamic conditions. Critical arching and bridge and rathole dimensions. Check the unconfined compressive stress to vertical pressure in the silo. Check for a cohesive arch in relation to the silo pressures. Measure wall friction angle at the various consolidation pressures. Carry out the design of stockpiles. Calculate the required pull out torque for feeders. Accurately calculate energy requirements for conveyors and feeders. Bulk solids and powder flow properties testing can also be used for quality assurance purposes – to ensure products meet purchase specifications for flow requirements and plant reliability. Companies in Europe and USA for example, use powder flow properties testing on plant on a continual basis to ensure their equipment operates at maximum efficiency. The flowability and strength of a bulk solid or powder is defined by its Flow Function. 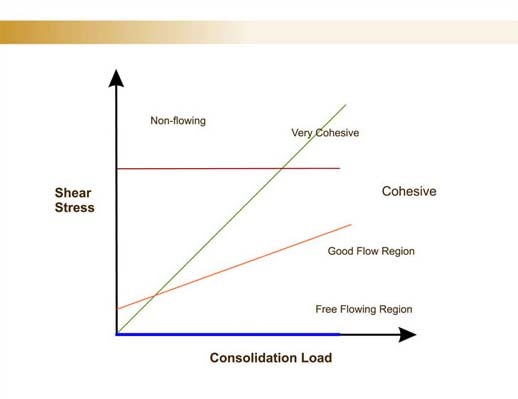 The flow function is the relationship between the major consolidation stress, and the unconfined yield stress. The following table 1 provides a guide to flowability based on the flow function calculation. The following Table 2 and Table 2a shows yield loci for various product types. These results can only be found after testing a product using a shear tester. Table 2 - Yeild Loci comparisons. Line 1 - Cohesionless bulk solid. Line 2 - Cohesive bulk solid. Line 3 - Ideal Plastic bulk solid. 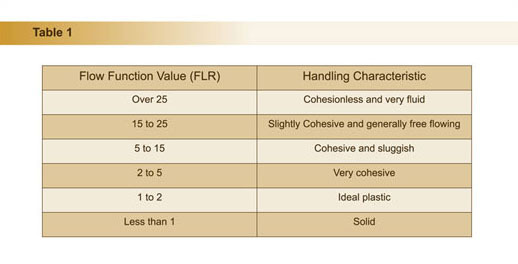 Line 4 - Ideal Fluidised bulk solid. Table 2a - Yield Loci comparisons - Expected product flow indicator. 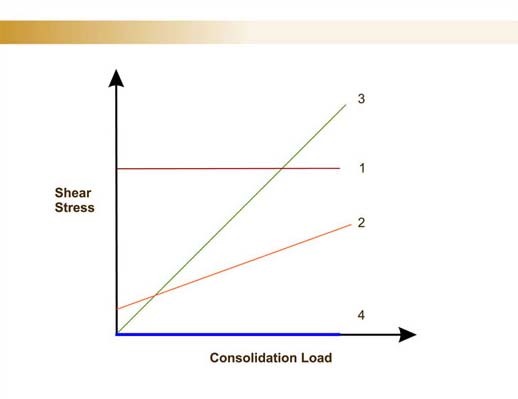 Cohesive bulk solids have a change of shear stress to the consolidating pressure. The do have very low flow functions, and will consolidate and agglomerate under compaction. Discharger styles need to be considered with caution. Ideal plastic product has a proportional shear stress to consolidation pressure relation, and the yield loci are represented as a 45 degree line. Ideal plastic products can only be reliably discharged from an ideal flow silo. Cohesion-less bulk solids, where there is only friction acting between particles. Ideal Fluidised bulk solids have no friction, nor cohesion, and are difficult to control used most traditional type dischargers. 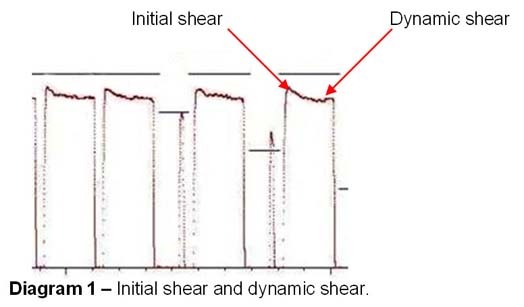 When carrying out bulk solids flow properties testing, it is important to measure the peak shear values as indicated in the following diagram 1. 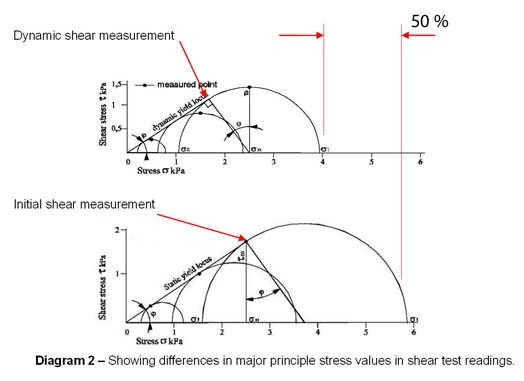 Whilst on appearance the difference between initial shear and dynamic shear may not seem to be significant, however, it plays an important role in the development of the Mohr’s circle for major principle stress, and unconfined compressive stress. The result is that design figures Major principle stress for silo and hopper design, can be significantly out - around 50% in the case shown below in diagram 2. The measured hopper wall friction angle is very important in the design of silo and hoppers. Not only is it used to assist in determining hopper wall angles, it plays a very important role in determining silo wall pressures for structural design purposes as well. 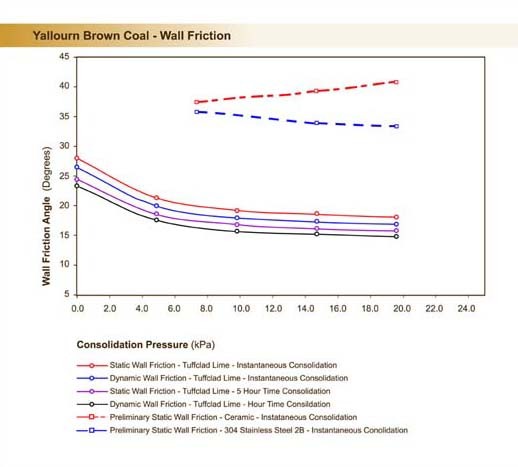 As can be seen in the above graph, wall hopper materials or liners can have significantly different wall friction values at various consolidation pressures. Shear test equipment that can measure wall friction. As we come across many different products, we needed a shear tester that could test a wide range of products including fibrous, high in moisture, granular as well as powders. The bulk density of a product is usually too generalised. It is only properly measured by a bulk density test which is carried out by the shear tester under various consolidation loads, and is known as the consolidated bulk density (or tapped bulk density by other measuring instruments). 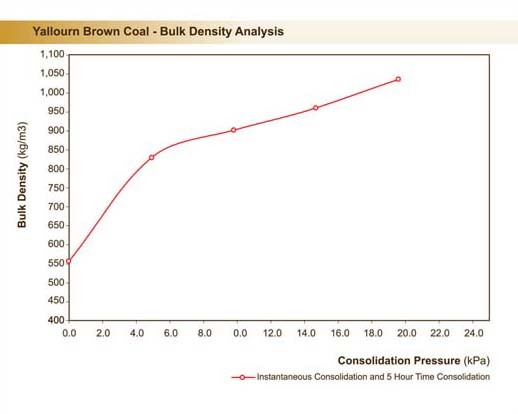 The following graph shows how the bulk density of a product can at various consolidation pressures. 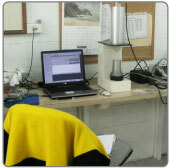 We use the Peschl Shear tester that meets these requirements. The Peschl shear tester provides a shear profile for the product as shown in Diagram 1. The supply of the shear profile is a guarantee that the product is sheared at it plastic shear level. Most products (For example, coal cement / flyash / ammonium nitrate) take a relatively short time (15 to 20 minutes) to carry out a physical shear test. Other products such as fertilizer or high fat food products for example, can take 1.5hours to reach its plastic shear point. Another important advantage of the Peschl shear tester is that it is easily transported to site, so we can test the product as close as possible to true characteristics – some products change their characteristics when removed from site through either moisture loss, moisture gain or even degradation or agglomeration when transported away from site. 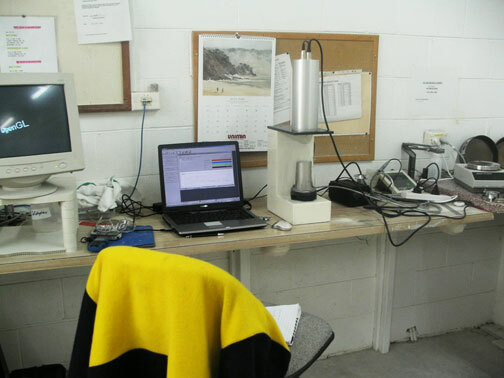 During commissioning, on site shear testing quickly identifies problem areas in relation to product flow, silo, hopper, discharger and equipment design. 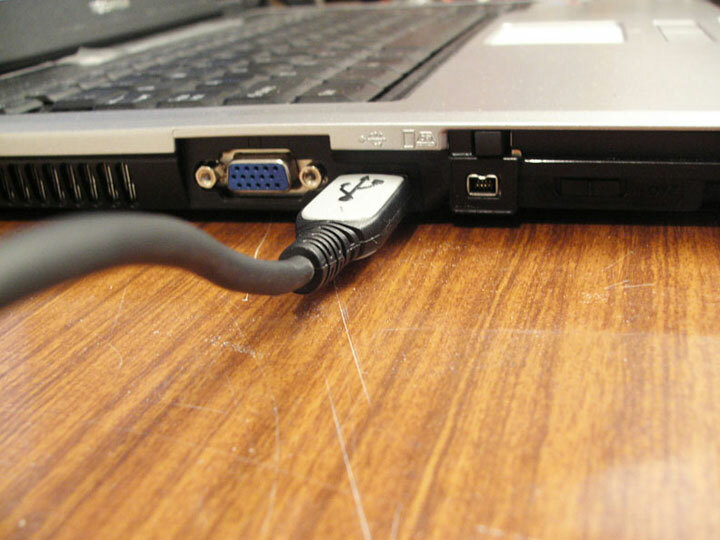 This greatly reduces commissioning times. Without testing a product for flow characteristics, you risk the problems associated with safety issues, poor plant design, long commissioning times or potentially have to de-rate equipment. So if you are about to design a plant, or having problems with your product or plant operation, contact us and we will be happy to be of assistance.